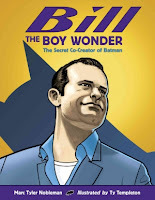 Original Content: Bill Finger--The Documentary "A Big Superhero Secret"
I saw this! Definitely have to take a look, especially since I grew up not far from Cleveland! Marc's a great guy. Our Internet access is too lousy to allow us to watch anything streaming, so I'll have to hope this is released some day as a rental.